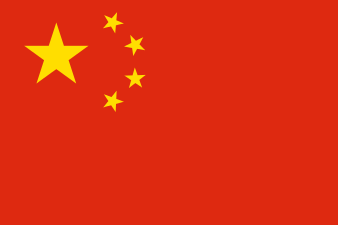 This article is about the flag carrier of the People's Republic of China. For the flag carrier of Taiwan (also known as the Republic of China), see China Airlines. For the parent company of Air China, see China National Aviation Holding. Air China was established and commenced operations on 1 July 1988 as a result of the Chinese government's decision in late 1987 to split the operating divisions of Civil Aviation Administration of China (CAAC) into six separate airlines: Air China, China Eastern, China Southern, China Northern, China Southwest, and China Northwest. Air China was given chief responsibility for intercontinental flights and took over the CAAC's long haul aircraft (Boeing 747s, 767s, and 707s) and routes. In January 2001, the former CAAC's ten airlines agreed on a merger plan, according to which Air China was to acquire China Southwest Airlines. Before the acquisition, Air China was the country's fourth largest domestic airline. The merger created a group with assets of 56 billion Yuan (USD $8.63 billion), and a fleet of 118 aircraft. In October 2002, Air China consolidated with the China National Aviation Corporation and China Southwest Airlines. On 15 December 2004, Air China was successfully listed on the Hong Kong and London Stock Exchanges. The airline also listed its shares on the Shanghai Stock Exchange on 18 August 2006. In 2006, Air China signed an agreement to join the Star Alliance. It became a member of the alliance on 12 December 2007 alongside Shanghai Airlines. On 2 December 2010, Air China received Spain's highest tourism industry award, the "Plaque for Tourist Merit". Air China was the first foreign airline to receive the award, which is given to organisations and individuals contributing to the Spanish tourism industry. Air China began offering Wi-Fi internet service on board its aircraft on 15 November 2011, making it the first Chinese carrier to offer this service. In 2012, after pressure from PETA, Air China stated that it would no longer transport monkeys to laboratories. PETA welcomed the airline’s announcement. In early 2015 it was announced that the airline had selected the Boeing 737 Next Generation and 737 MAX for its fleet renewal programme of 60 aircraft. The deal, with a value of over $6B at current list prices, has yet to be finalised. The entity Air China Limited was registered in 2003, and its shares began trading in Hong Kong and London on December 15, 2004. Originally the airline corporate entity was Air China International, which was founded 2002 Air China International incorporated China Southwest Airlines and the air transportation services of the China National Aviation Company, becoming a new entity. As of June 2015, it ranks no. 1 of Chinese companies for long term accounts payable. The Air China HQ Building (S: 国航总部大楼, T: 國航總部大樓, P: Guó Háng Zǒngbù Dàlóu), the corporate headquarters, is located in Zone A of the Tianzhu Airport Industrial Zone (S: 天竺空港工业区, T: 天竺空港工業區, P: Tiānzhú Kōng Gǎng Gōngyèqū) in Shunyi District, Beijing. The company registered office is on the ninth floor of the Blue Sky Mansion (S: 蓝天大厦, T: 藍天大廈, P: Lántiān Dàshà), also in Zone A of the Tianzhu Airport Industrial Zone. Air China's route network extends throughout Asia to the Middle East, Western Europe, and North America from its main hub at Beijing Capital International Airport. It also currently reaches a significant number of Asian, Australian and European destinations from Shanghai. Some international routes operate from Chengdu, Chongqing, Dalian, Hangzhou, Kunming and Xiamen. It is one of the few world airlines that fly to all six inhabitable continents. On 10 December 2006, Air China began serving its first South American destination, São Paulo-Guarulhos (via Madrid-Barajas). This was the airline's longest direct flight. The service was initiated with a Boeing 767-300ER, but due to increased demand, the service has been upgraded to an Airbus A330-200. Deliveries of the carrier's 19 new Boeing 777-300ERs commenced in mid-2011, with the aircraft forming the new "backbone of its future longhaul operations". The new Boeing 777-300ERs replaced the Boeing 747–400s on routes to U.S. destinations such as Los Angeles, New York, and San Francisco, but was expected to first enter service on flights to Paris from March 2012. The Boeing 777-300ER began to replace most 747 service once sufficient numbers entered the fleet. Air China expanded its operations in India with a Beijing-Mumbai route begun in September 2011, while the existing Delhi route was upgraded to the A330. The airline also launched service to Mumbai from Chengdu on 2 May 2012. The airline began using the Boeing 777-300ER on one of its two daily Beijing-Los Angeles flights on 1 February 2012. Beginning in late-2012 to early 2013, the airline will replace the Boeing 747-400s currently servicing the New York and San Francisco routes with the Boeing 777-300ER. With the addition of the Boeing 777-300ERs on the US routes, Air China increased frequency on the Beijing-New York route, changing the flights from 7 to 11 flights a week by adding two new flights to the route (CA989/990). On 21 January 2014, the airline launched its service to Hawaii with flights from Beijing to Honolulu, the first nonstop flights between the two cities. The airline also increased the frequency of service on the Beijing-Houston Intercontinental route from four times weekly to daily service from 30 March 2014. Beginning 10 June 2014, Air China introduced new nonstop service from Beijing to Washington-Dulles, operated by a Boeing 777-300ER. As of September 29 2015, Air China also introduced a 3 times weekly flight to Montréal–Pierre Elliott Trudeau International Airport in a codeshare with Air Canada. The Montreal flight was extended to Havana from 27 December 2015. Air China started its direct flights to Johannesburg, South Africa from 29 October 2015. The flight operates three times weekly. The Flag of China painted onto the side of a Boeing 747-400. Air China is the only flag carrier of China. Boeing 777-200 9 — — 30 63 217 310 To be phased out. Boeing 757-200F 4 — — Formerly part of Air China's passenger fleet. On 15 April 2002, Air China Flight 129, a Boeing 767-200ER from Beijing to Busan, South Korea, crashed into a hill while trying to land at Gimhae International Airport during inclement weather, killing 129 of the 166 people on board. This is Air China's first and only fatal accident to date. On 10 June 2013, Air China Flight 4307 flying from Chengdu to Guangzhou. As the 757 was climbing through 26000 ft when an unidentified object collided with it. The flight returned to Chengdu for safety reasons, and post-flight examinations revealed that the unknown object caused severe damage to the composite radar dome of the aircraft. ↑ "让世界发现你". Air China. Retrieved 2015-12-31. ↑ "About Air China". Star Alliance. Retrieved 6 May 2015. ↑ "Directory: World Airlines". Flight International. 2007-03-27. p. 55. 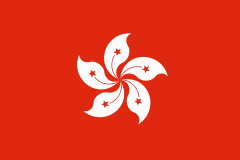 ↑ Ng, Eric, "Air China Set to Announce Lead Bank for Listing," South China Morning Post, Bus. Sec., July 16, 2001, p. 4. ↑ Holland, Tom, "China Break-In," Far Eastern Economic Review, October 25, 2001, p. 41. ↑ "Air China plans to buy 15 new planes". Seattle Post-Intelligencer. Associated Press. October 30, 2002. Archived from the original on 6 February 2011. Retrieved 6 February 2011. ↑ "air china launches flight shuttle bus combined ticket for domestic routes". Antara News. Retrieved 2015-02-23. 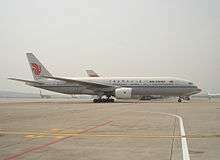 ↑ "Broadband browsing at 32,000 feet: Air China introduces new fast internet service". Retrieved 8 September 2016. ↑ Wadman, Meredith. "Air China won't fly research primates". Nature. Retrieved 28 January 2015. ↑ 新闻中心, 中国经济网. "国内航班首试空中上网服务_中国经济网――国家经济门户". Retrieved 8 September 2016. ↑ "Air China". Airliner World: 17. March 2015. 1 2 "Corporate Social Responsibility Report 2010." (Archive) Air China. p. 7. Retrieved on October 12, 2012. "Headquarter location No. 30, Tianzhu Road, Tianzhu Airport Industrial Zone, Beijing, China"
↑ "Long term accounts payable Rankings for Chinese Companies". China Stock Facts. 2015. ↑ "Membership." (Archive) IATA. Retrieved on October 12, 2012. "Air China Limited West 6th Floor Air China HQ Building No 30 Tianzhu Road Tianzhu Airport Economic Development Zone Beijing China (People's Republic of) 100621"
↑ "联系我们." (Archive) (Archive) Air China. Retrieved on October 12, 2012. "北京市顺义区天竺空港经济开发区天柱路30号国航总部大楼E410房间"
↑ "Interim Report 2012." (Archive) Air China. Retrieved on October 12, 2012. "The registered office of the Company is located at 9th Floor, Blue Sky Mansion, 28 Tianzhu Road, Zone A, Tianzhu Airport Industrial Zone, Shunyi District, Beijing 101312, the PRC." ↑ "Air China Expands With Second Daily Nonstop Flight From Los Angeles to Beijing". Prnewswire.com. Jan 12, 2011. Retrieved 2013-06-30. ↑ Business Standard (2011-07-01). "Air China expands India operations". Business-standard.com. Retrieved 2011-10-17. ↑ Christine Boynton (2012-01-19). "Air China begins replacing 747s with 777s on US routes". ATWOnline. Retrieved 2013-06-30. ↑ "New York to Beijing routes increased from one flight to two flights per day". ↑ Houston Airport System (14 January 2014). "Air China Expands Nonstop Houston-Beijing Service To Daily". Retrieved 24 April 2015. ↑ "Air China to Commence Beijing-Washington Nonstop Service". wallstreet-online.de. Retrieved 24 April 2015. ↑ "Air China to Launch Beijing-Montreal Flights in Cooperation with Air Canada". newswire.ca. Retrieved 28 May 2015. ↑ "Air China puts direct route to SA on hold". News24. 29 May 2015. ↑ "Profile on Air China". CAPA. Centre for Aviation. Archived from the original on 2016-10-29. Retrieved 2016-10-29. ↑ "Air China fleet". ch-aviation.ch. Retrieved 2013-09-23. ↑ 30 June 2015. "Air China Fleet in Planespotters.net". Planespotters.net. Retrieved 2015-06-30. ↑ 13 March 2014. "Air China Cargo Fleet in Planespotters.net". planespotters.net. Retrieved 2014-03-13. ↑ 24 May 2013. "Air China Orders 100 Airbus A320 Jets". industryweek.com. Retrieved 2013-09-22. ↑ 27 May 2013. "Air China orders 100 Airbus A320 planes". cargonewsasia.com. Retrieved 2013-09-22. ↑ "Air China in US$2.9b order for 12 Airbus A330-300 long-haul jets". channelnewsasia.com. Retrieved 2016-02-29. ↑ Shih, Kai-Chin. "Air China Boeing 747-8I Interior Information". >talkairlines. >talkairlines. Retrieved 30 September 2014. ↑ "Air China to Sell 10 Boeing 777-200s". China Aviation Daily. 9 March 2016. Retrieved 18 September 2016. ↑ "Air China to take six more 777-300ERs". 7 January 2016. Retrieved 8 September 2016. ↑ "Air China begins 2-class 777 service from Dec 2016". routesonline.com. Retrieved 2016-10-01. ↑ 2016, UBM (UK) Ltd. "Air China Files Preliminary Boeing 787-9 Operational Routes in S16". Retrieved 8 September 2016. ↑ "Air China switches 15 787-8s order to 787-9s". Flightglobal.com. 1 September 2010. Archived from the original on 2 September 2010. Retrieved 1 September 2010. ↑ 30 August 2013. "Air China Cargo to operate 757-200 Freighter fleet for China Postal Airlines". cargofacts.net. Archived from the original on 2013-09-27. Retrieved 2013-09-22. ↑ "PhoenixMiles". Retrieved 8 September 2016. ↑ "Hijacking description". Aviation Safety Network. Retrieved 29 August 2013. ↑ The Evil Queen (2002-04-15). "Chinese jet hits foggy mountain - World News". TVNZ. Retrieved 2013-06-30. ↑ "ASN Aircraft accident Boeing 767-2J6ER B-2552 Pusan-Kimhae Airport (PUS)". Aviation-safety.net. Retrieved 2013-06-30. ↑ "Air China Boeing 757 possibly collided with UFO". Retrieved 8 September 2016. ↑ "Shocking photo: What object caused this much damage to Air China's Boeing 757?". The Aviation Writer. Retrieved 14 January 2015. ↑ "Air China Under Fire For 'Racist' Warning On London Minority Areas". Retrieved 8 September 2016. ↑ "Air China magazine apologises for London race slur - BBC News". Retrieved 8 September 2016. Wikimedia Commons has media related to Air China.